Cleans dirt stains and soils from carpets, fabric and leather upholstery. For general cleaning, add 1 part concentrate to 30 parts water. For heavy cleaning or stain pre-spotting, add 1 part product to 15 parts water. 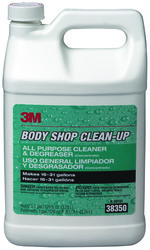 3M™ All Purpose Cleaner and Degreaser is a heavy duty cleaner concentrate designed for both interior and exterior vehicle cleaning applications. 3M™ All Purpose Cleaner and Degreaser removes oil, grease, and other tough soils from vehicle engines, tires, wheels, and other heavily soiled exterior vehicle surfaces, and is very effective for removing insect residue from the fronts of vehicles. 3M™ All Purpose Cleaner and Degreaser also cleans and removes soils and most stains from carpet, fabric upholstery, vinyl, leather, and other interior vehicle surfaces.Directions for Use:DILUTION - 1:15(Add 1 cup concentrate to a gallon container and fill with water.) Use for degreasing, tire and wheel cleaning, insect residue removal, carpet and upholstery stain removal, and other heavy duty cleaning applications.DILUTION - 1:30(Add Â½ cup concentrate to a gallon container and fill with water.) Use for cleaning vinyl, leather, plastic and other lightly soiled vehicle surfacesDegreasing/Insect Residue Removal: (1:15 dilution)1. Spray diluted cleaner onto heavily soiled areas - engines, tires, wheels, insect residue, etc. Let stand about 2 minutes.2. Scrub/brush heavily soiled areas as needed.3. Rinse thoroughly using a high pressure washer.Carpet/Fabric Upholstery Cleaning (1:15 dilution)1. Spray diluted cleaner directly onto the surface.2. Work the surface using the appropriate sponge, cloth, or brush.3. Remove soil using an extraction unit.Vinyl/Leather - Light Duty Cleaning (1:30 dilution)1. Spray the diluted cleaner directly onto the surface, or spray onto a terry cloth towel and apply.2. Work the surface using the appropriate sponge, cloth, or brush.3. Remove soil using a clean, dry terry cloth towel.Tips:- For maximum effectiveness do not allow degreaser to dry before rinsing.- For heavily soiled wheels; first apply 3M™ Heavy Duty Wheel Cleaner, soak two minutes, then apply 3M™ All Purpose Cleaner and Degreaser (1:15 dilution), soak one minute, scrub as needed and rinse.- For stains on fabric, use 3M™ Adhesive & Tar Remover followed by 3M™ All Purpose Cleaner and Degreaser - 1 to 15 dilution.